Whale watching in thick fog around Vancouver Island in British Columbia, Canada can be extremely challenging when trying to locate Orca. Days when fog sets in on the waters around Vancouver Island, Canada locating Orca in the wild can be a strenuous exercise for tourists as well as for the captain of the boat. These whale watchers were lucky enough to spot this male Orca as he swam past their boat through the opaque fog. Around Northern Vancouver Island, the Northern Resident Killer Whales travel in pods so if you find one Orca in the fog, there is a good chance his family is not too far away. Transient and Off-shore killer whales are other species of Orca that can also be seen around Northern Vancouver Island in British Columbia, but the Northern Residents are seen on a more regular basis. 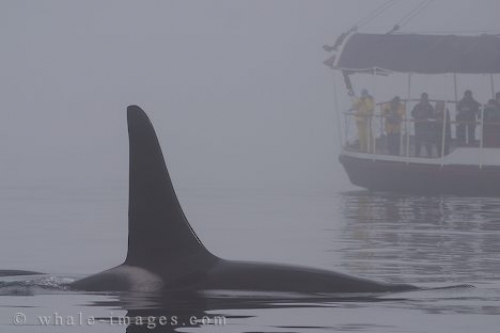 Photo of tourists watching a male Orca pass by in the dense fog off Vancouver Island in British Columbia, Canada. ... trip on a day that is sunny, cloudy, rainy or you are in fog that is as thick as pea-soup, viewing Orca in their natural habitat around Northern Vancouver Island is an amazing experience.